Stay top of mind with your customers by sending beautifully designed, customizable direct mail pieces or postcards with prepared templates by FTD. 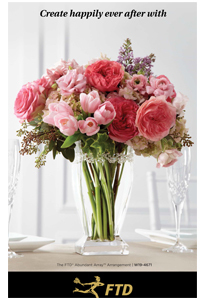 Whether you are introducing your offerings to prospective customers or engaging existing customers, direct mail is great for promoting your floral design skills and providing incentives to drive orders to your shop. The direct mail pieces and postcards feature FTD codified exclusives and everyday florist-filled products. Each marketing piece can be customized with your shop's information. Click Here for instructions on how to print and create direct mailers. Birthday Mailer: 5 1/2" x 8 1/2"
Mailer 1: 5 1/2" x 8 1/2"
Mailer 2: 5 1/2" x 8 1/2"
Mailer 3: 5 1/2" x 8 1/2"
Mailer: 5 1/2" x 8 1/2"
Birthday Postcard: 4.25" x 6"
Farmhouse Collection: 4.25" x 6"
Everyday Postcard: 4.25" x 6"
Wedding Postcard: 4.25" x 6"
New Baby Postcard: 4.25" x 6"